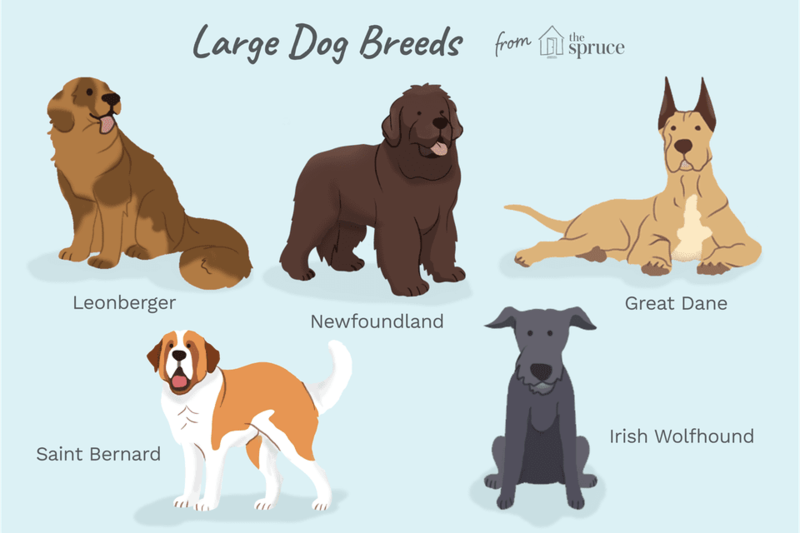 Have you ever seen a giant dog breed and wondered what it was? These extra large dogs are loved by many and often called "gentle giants." While plenty of people prefer small dog breeds, many others feel there's nothing better than giant dogs. Giant dogs make wonderful pets for the right households, but they certainly are not for everyone. There are several factors to consider before you get a giant dog breed. Consider cost before getting a giant dog. Dog food, pet supplies, and veterinary preventive products usually cost a significantly higher amount of money for the largest dogs. Make sure you have the space for such a massive dog. You don't necessarily need a huge yard, but your home needs to have enough space to put a giant dog bed. Also, there needs to be enough space for your dog to comfortably move around. Think about the span of a giant dog's tail and the damage it can cause by accident! Pet waste is another factor to consider. A giant dog has giant stools and you will need to clean them up. You should have extra poop bags with you at all times. Many giant dogs also have a tendency to slobber a lot. Many owners need to carry around extra supplies of "drool rags" to clean up saliva. One of the most difficult parts of falling in love with a giant dog breed is the fact that it will typically have a shorter lifespan than the average dog. Many giant dog breeds only live until 7-10 years of age. The average lifespan of dogs is about 12-15 years, and smaller breeds can live even longer. Whether or not a giant dog is right for you, it's still fun to learn about these massive beauties. Learn about some of the largest dogs on earth and the most popular giant dog breeds around. One might argue that this huge and majestic creature more closely resembles a small horse than a dog. Either way, the beautiful Great Dane is sure to stand out in a crowd. But it is more than appearance that makes this breed stand out. The personality of the Great Dane is unforgettable. These dogs are gentle, playful, friendly and incredibly loyal. 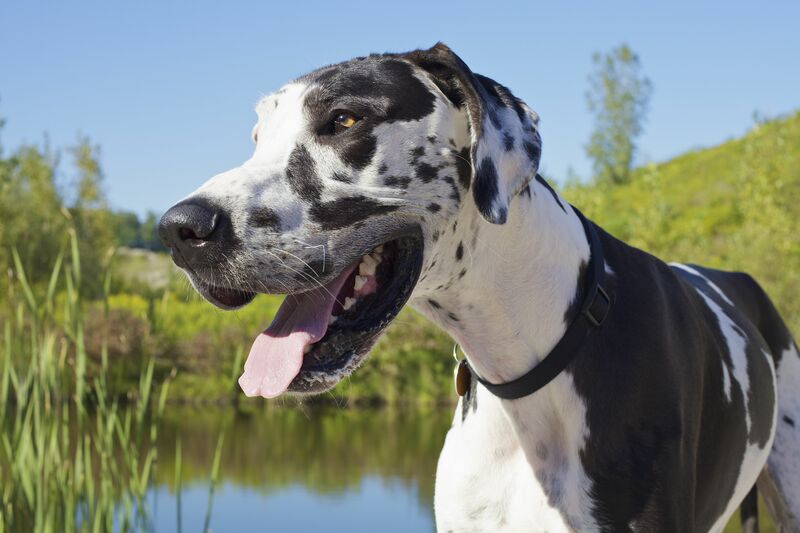 The Great Dane is a native of Germany that was developed as a boar hunter and, later, a watchdog. Great Danes weigh anywhere from 100 to 200 pounds and stand about 28 to 30 (or more) inches tall. Considered the largest of all dog breeds, the English Mastiff's name sounds just like its description: massive. This giant dog breed is all brawn and power on the outside, but deep down it is a lovable, mushy companion--and often a bit of a couch potato! These dogs can top the scales at 220 pounds and can stand 30 or more inches tall. However, it looks like a large percentage of the weight is in their huge heads. Some considerations if you are thinking about getting a Mastiff: You'll likely need to carry around a rag or cloth for slobber. Make sure to duck when a head shake comes on! You'll also need to protect people and objects from that massive tail (and protect the tail itself from damage). The Leonberger is a beautiful, massive working dog with a kind and gentle disposition. Though it is not an extremely common breed, the Leo has its own following, and for good reason. This breed is known to bond closely with its family and seems to have a kind of intuition when it comes to human emotions. Because of this, they make excellent family members and also superb therapy dogs. They are gigantic yet gentle with incredibly soft coats. If you love giant dogs with even bigger hearts, have the room for a dog that weighs 120 to 170 pounds, and can exercise him daily, then you might have found your match. The Leonberger originates from Leonberg, Germany. The Bullmastiff is a powerhouse that was originally developed for protection. English gamekeepers in the mid-19th century crossed the Mastiff and the Bulldog. The result was a powerful, fearless dog that could stop poachers in their tracks. Today's Bullmastiff is still a highly capable guard dog, but the breed is most treasured as a companion. Despite a powerful and somewhat intimidating appearance, this is a gentle and affectionate dog that forms a solid bond with its family members. However, the Bullmastiff's tough side does instinctively comes out when necessary. Like its cousin, the Mastiff, be prepared for some slobber. Weighing from 100 to 130 pounds and standing 24 to 27 inches tall, there's plenty to love about these big sweeties. Newfoundlands are not only loving companions, they are also amazing workers. With their webbed feet and thick, waterproof coats, they evolved into perfect water dogs. They originated in the Canadian province of Newfoundland where, for centuries, they have worked alongside fisherman and saved numerous people from drowning. It's simply in their nature to assist and protect people, but always with a gentle spirit. It is for these reasons that the Newfie is also an ideal family pet. He will watch over and play with the children, he learns well, and he seems eager to please. He's cuddly yet athletic. If you have the room for a dog of 100 to 150 pounds that is 26 to 28 inches tall and will never let you down, then a Newfie might be the one for you. The Saint Bernard is a legendary hero of the Swiss Alps. While it is true that they were skilled search and rescue dogs, the tales about barrels of alcohol hanging from their necks are actually folklore. In fact, much of the Saint Bernard's history is cloaked in legend and the truth is debated by many. The indisputable fact is that Saint Bernards are massive dogs with even bigger hearts. Though they still have the ability to be excellent working dogs, Saints are typically seen as gentle, lovable family companions. The breed was also made famous when it was portrayed as a lovable goofball in the film "Beethoven" and its many sequels. Most Saint Bernards weight around 130 to 180 pounds and are about 26 to 27 inches tall. The Dogue de Bordeaux is a huge, lovable, slobbery hunk of dog. This massive canine with a giant head may look fierce, but the breed is usually extremely loyal, goofy and gentle. However, the Dogue is also a quite capable guard dog. Sometimes called the French Mastiff, the Dogue de Bordeaux originated in France and has been around for ages. However, the breed was not officially recognized by the AKC until 2008. The Dogue de Bordeaux is probably best remembered as the slobbery but lovable giant dog in the film "Turner and Hooch," where the breed was accurately presented. Dogues typically weigh about 100 to 150 pounds and are 23 to 27 inches tall. The Great Pyrenees is a massive and regal dog that is both a powerful worker and gentle companion. Among the oldest of dog breeds, this working dog has a long history of guarding sheep and protecting homes. Pyrs were once beloved by French royalty and nobles. Perhaps this is because of their diligence combined with calm, gentle dispositions. Their beauty and grace were surely a reason as well. Like most puppies and adolescent dogs, young Pyrs are very active. It takes training and patience to end up with a stoic, well-behaved adult dog. Fortunately, the intelligent Great Pyrenees is a fast learner. Above all, this dog is a hard worker that needs plenty of exercise. This breed typically does well with children and other pets and may weigh up to 150 pounds. The Irish Wolfhound, as its name implies, hails from Ireland, but the breed's roots can actually be traced back to Roman records from the fourth century. Historically, Irish Wolfhounds have been regal, noble canines that bravely fought in battle, fiercely hunted wolves, loyally guarded homes and acted as steadfast companions. Though in modern times the breed is primarily seen as a companion alone, the personality in much the same. This is a sighthound (Greyhound-type) breed and is, therefore, athletic, graceful and fast. Weighing up to 180 pounds and standing at as much as 34 inches tall, this is an immense and powerful dog breed. Irish Wolfhounds need more space and exercise than some of the other giant breeds and generally do not thrive in small living spaces. The Neapolitan Mastiff is right up there with its cousin, the Mastiff when it comes to size. Weighing up to 200 pounds and at a height of up to 31 inches, this dog breed is a true giant. The Neo is an Italian breed with ancient roots that can be traced back to the Roman army's dogs of war. They were later developed as estate guard dogs. Also called the Mastino, the Neo has a unique appearance, the result of years of inbreeding. This breed is known for its distinct wrinkles and loose skin, massive bones, and notably lumbering gait. Today's Neapolitan Mastiff remains loyal and protective of its family. A generally mellow and gentle dog, the Neo shows its tough side when protection is needed.